Rome’s famous “Flavian Amphitheatre” is the largest amphitheatre ever built. Constructed within 8 years, it is estimated that on its completion in 80 AD it could hold between 50.000 and 80.000 spectators. Until it was declared an UNESCO World Heritage Site in 1980, it had been used as a gladiatorial arena, a theatre, a place of execution, a shrine, a quarry, for housing a religious order and for entertainment. Today it is one of Italy’s prime tourist attractions, drawing millions of visitors annually. The Colosseum can be reached from Rome Termini railway station Line B, nearest stops: Collosseum or Roman Forum. With approximately 2.5 million visitors each year, the 2,700 year old village of Pompeii (near Naples) – which was buried under tons of ash and pumice in 79 AD when Vesuvius erupted – is one of Italy’s prime tourist attractions. The site, which was only rediscovered and excavated in the years between 1599 and 1748, offers unique insight into the way the Romans lived. Pompeii can best be accessed by train from Naples (around 45 minutes) or Sorrento (30 minutes). Overpriced, kitschy and touristy though it may be – and it is all of these – there is something about gliding soundlessly down the canals of the Venetian lagoon just as people did in the 17th and 18th centuries which makes a gondola trip a one-off, unforgettable experience, particularly at night. It is so very Italian, particularly if you take an ice cream with you! Venice has its own airport, the Marco Polo Tessera, which is 20-25 minutes from the city center by bus or (!) waterbus. Milan`s enormous Duomo Gothic cathedral, which took six centuries to complete, is the largest in Italy and the fifth largest in the world. At 108 metres tall and with an interior surface area of 11.700 square metres, this cathedral can seat 40.000 visitors! Inside it houses many treasures and sacred relics, including the statue of St. Bartholomew the Flayed (1562), 3 altars and even one of the nails which pierced Christ’s hand, according to legend. An awe-inspiring spectacle of sacred architecture, the Duomo is a must for lovers of history and ancient buildings alike. It is best reached by metro from Milan’s Centrale railway station (12 minutes). Situated in the Vatican City, “la Cappella Sistina” is most-famed for its frescoes, in particular its famous ceiling and “The Last Judgement” painted by Michelangelo in the years between 1508 and 1512. Masterpieces by Botticelli, Raphael and others adorn the walls, and the floors are wonderfully intricate inlaid marble mosaics (known as “pietra dura”). Visitors to the Vatican City should definitely include the Sistine Chapel on their list of things to see. The Vatican City is around 30 minutes from Rome’s Termini railway station by car or bus (exit “Roma San Pietro”, then 12 minutes on foot). Around 9 kilometres east of Naples towers the famous A Mount Vesuvius (1,281 m high), which erupted in 79 AD burying the towns of Pompeii and Herculaneum. Vesuvius is the only volcano on the European mainland to have erupted within the last century: the last eruption was in 1944. The area surrounding the volcano was designated a national park in 1995, however the summit is available to visitors. Road access stops at 200 metres from the summit, after which access is on foot only. Mount Vesuvius (“Il Monte Vesuvio”) is 24.5 kilometres from Naples railway station (Stazione di Napoli Centrali) and can be reached in 45 minutes by road. Famous worldwide for its lopsided appearance (caused by a foundation of only 3 metres in unstable subsoil), the leaning tower of Pisa was built in three stages, commencing in 1173 and continuing for a further 199 years, with some structural strengthening carried out between 1990-2001. Actually the bell tower of the cathedral, the leaning tower of Pisa contains 7 bells, one for each note of the scale. It is 55.86 metres high and one of Italy’s largest tourist attractions, drawing over 1 million visitors annually. Pisa is situated in Tuscany, central Italy, about 85 km west of Florence. The city has its own airport (Aeroporto Galileo Galilei); buses run to the city center every 10 minutes (exit: Ospedale S. Chiara). The Solfatara in Pozzuoli, near Naples, is a series of shallow craters created by a now dormant volcano which still emit sulfurous fumes and jets of steam. The healing properties of its vapors were well recognized by the Romans 4000 years ago; quite apart from that, it is a fascinating and scary glimpse into the internal workings of our planet. Pozzuoli is best accessed by train from Naples (around 10 minutes). The underground line 2 then takes you directly to “Pozzuoli-Solfatara”, an 800m walk from the Solfatara. “Cinque Terre” – quite literally “five places” – is the name given to five villages on the Ligurian coast of northwest Italy – Vernazza, Corniglia, Monterosso al Mare, Riomaggiore and Manarola. Owing to their picturesque aspect between cliffs and sea and the fact that they can be easily accessed by rail or boat, but only under extreme difficulty by road, they are immensely popular with tourists. This explains in part why they were designated an UNESCO World Heritage Site in 1997. All five villages are directly accessible by train from Genoa, Pisa or Rome and ferries run from Genoa, Portofino and Portovenere from April to September. The village of “La Spezia” (78 km southeast from Genoa) is only 7 minutes from Riomaggiore by train. The Vatican City is the smallest sovereign state worldwide, ruled by the pope and with all major administrative and political positions occupied by members of the Catholic clergy. It subsists entirely on donations from Catholics worldwide, the sale of stamps, books and other mementoes and entrance fees to its museums and sacred architectural spaces. Its historical roots go back to St. Peter, who was supposedly the first Pope to live there (30 AD); it was given its political independence in 1929 under the Lateran Treaty. Located across the Tiber river (Fiume Tevere) from central Rome, the Vatican City can be accessed from Rome`s Termini railway station in around 40 minutes by bus (exit Gregorio Vii, thereafter 11 minutes on foot). The famous “Grotta Azzurra” , a sea cave extending around 50 m into the cliff and with a depth of 150 metres, is situated on the coast of the island of Capri, southern Italy. Since its entrance is a mere 1 metre high, it can only be accessed at low tide and in calm waters; visitors must lie face downwards on a four-man boat to enter the cave. However, these minor discomforts are more than worth it, because the water of the cave is an unbelievable clear blue, lit with silver flashes, like a starry sky. 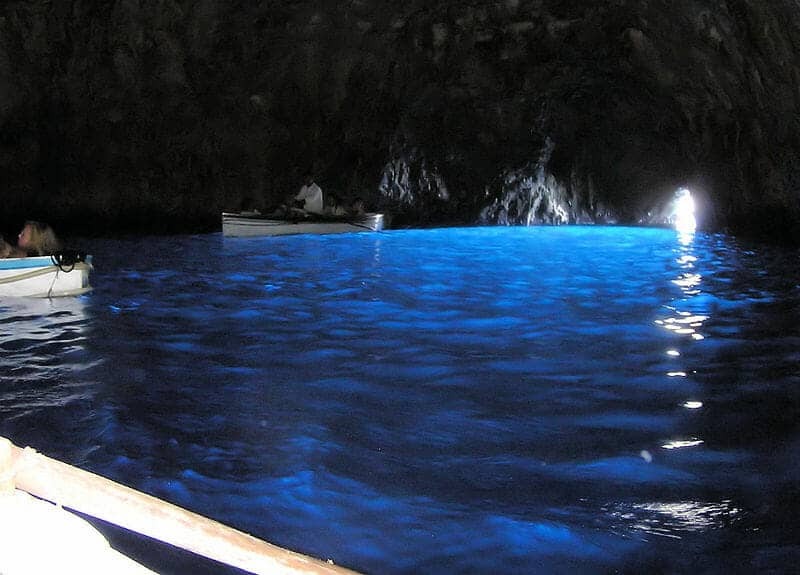 The cave is Capri`s number 1 tourist attraction, and with good reason. Entrance to the cave is by boat from Anacapri. A ferry/shuttle bus service runs regularly from Naples to Anacapri (around 2 hours 40 minutes). The mountainous province in northern Italy known as “Trentino” was already inhabited in the middle-Stone-Age; today it is a Mecca for lovers of winter sports – snowboarding, skiing, snowshoeing – as well as a variety of festivals, markets and social activities. The city of Trento in the Adige river valley in Italy’s south Tyrolean mountains existed as “Trent” at least as early as 4 BC and was part of Austria until it was annexed by Italy in 1919. It offers an interesting combination of Austrian and Italian culture and architecture and is well worth a visit. The Gardaland fun park is the largest theme park in Italy and one of the largest in Europe. A seemingly never-ending choice of fantasy rides, thrill rides and more tranquil tours of pirate’s caves and ancient Egypt – plus live shows which change regularly – await the fun-loving visitor of any age. The park also has an aquarium and its own hotel and attracts three million visitors a year. It was ranked fifth out of the ten best adventure parks in the world in 2005. Gardaland is approximately 30 km west of Verona and can be reached by train from Verona`s railway station in around 45 minutes (exit Gardaland). By far the most fascinating attraction on the beautiful island of Sardinia are the “Nuraghi” – a series of strange, megalithic edifices dating from nearly 2000 BC, relics of the Nuragic civilisation which occupied Sardinia during the Bronze Age and about which almost nothing is known. 7.000 of these constructions are still to be found on Sardinia, mainly in the northwest and southern center of the island. Sardinia has five airports, the largest being the Cagliari Elmas airport. Alternatively the island can be accessed by ferry from a number of Italian ports, notably Civitavecchia, Palermo, La Spezia or Naples. Approximately 1.5 kilometres north of Venice lies the series of small islands linked by bridges known as Murano, which have been famous for their glass-making for centuries. It is thought that the Venetian glassmakers – who were relocated to Murano from Venice in 1291 owing to fear of fire – had their origins in 8th century Rome, with strong Asian and Muslim influences. Today Murano produces the largest quantity of Venetian glass worldwide, however factories have replaced many of the glass artists of the past, of whom only around 1.000 still practice their art on Murano. The “Museo del Vetro” (Glass Museum) in the Palazzo Giustinian tells the story of glass-making from its origins to the present day. For insight into glass-making techniques, the Mazzega glass factory gives demonstrations for tourists. Murano is easily accessible from S. Zaccaria in Venice (Line 4.2 waterbus, around 40 minutes). The Medici villas and gardens comprise a total of 27 villas and two gardens (Giardino di Boboli and Giardino di Pratolino) built between the 14th and the 16th centuries, each of which was occupied by a significant member of the Medici family. Set in the glorious countryside of Tuscany, the villas demonstrate the power and wealth, but also the culture of this family which ruled Florence for 300 years. Most famous are the Villa di Caffagiola (Barberino di Mugello) and the Villa die Trebbio (San Piero a Sieve). The twelve most significant villas and two gardens have been a designated UNESCO World Heritage Site since 2013. Barberino di Mugello is around 30 km north of Florence and can be accessed by bus in 40 minutes, or 30 minutes by car. Guided day tours of the villas are also available. On the banks of Lake Maggiore in the north Italian province of Novara lies the commune of Arona, which has been inhabited since at least the 18th century BC. A well-loved tourist destination as well as a busy port, it offers many fascinating cultural insights into its history, including the Sacro Monte (“Sacred Hill”) di Arona, the Rocca di Arona (Arona`s famous castle) and the archaeological museum on the Piazza S. Graziano, with relics going back to prehistory. Arona is also a good starting-point for exploring the Lake Maggiore area. It is around 70 km northwest of Milan and is accessible by train in just over an hour. The Tremiti islands are an archipelago in the Adriatic, so-called because of their frequent earthquakes (“Tremiti” means “tremors”). Of the 5 islands, only two – San Domino (with the only sandy beach) and San Nicola – are inhabited. That aside, the islands are sensational for scuba-diving, canoeing and gentle trekking, and San Domino`s caves and secluded coves – not to mention its excellent fish restaurants – are the ideal backdrop for an idyllic holiday. San Domino can be accessed directly by air from Foggia (around 20 minutes); alternatively, ferries run regularly from Termoli, Vieste and Rodi Garganico e Capoiale. Famous for its historic city center (a designated UNESCO World Heritage Site), its cooking, its art and museums and its semi-annual mediaeval horse-racing contest (the “Palio”), Siena is one of Italy’s most-visited tourist venues. Founded by the Etruscans (900-400 BC), it offers many rare and lovely examples of mediaeval or Gothic-Romanesque architecture (particularly the Piazzo del Campo and the Cathedral), but also delicious culinary specialties including wild boar and hare, and excellent wines. Siena is around 75 km south of Florence and can be reached directly by rail in 90 minutes. For those who like things creepy, Rome has around forty ancient catacombs dating back to the second century AD and comprising Roman, Christian, Jewish and Etruscan burial sites. Particularly worthy of a visit are the Catacombe di San Callisto, the Catacombe di San Domitilla and the Capuchin crypt (under the Capuchin Church of Immaculate Conception, or Santa Maria della Concezione dei Cappuccini). Guided tours of the Catacombs, combined with exploration of the ancient Via Appia (road leading out of Rome) are probably the best way to enjoy this somewhat macabre treat and give yourself a break from the bustle of a large city. The town of Assisi, largely known as the birthplace of St. Francis, is situated in the Umbrian region of central Italy in the province of Perugia. The area was inhabited at least since 1000 BC, firstly by Umbrians, then by Etruscans, and finally by Romans, and the architecture of Assisi reflects its ancient history in virtually untouched form. Particularly worthy of a visit are the Rocca Maggiore (a mediaeval fortress high above the town) and the Basilica of St. Francis; however, with its serene atmosphere and breathtaking views from the slopes of Mount Subasio, Assisi is a gift for body and soul. Assisi is located 172 km southeast of Florence and 173 km northeast of Rome and can be accessed directly by rail from either city in around 3 hours. The closest airport is the Aeroporto Internazionale dell’Umbria in Perugia (17 km). Established in 1990 and run by the firm Ferrari since 1995, the Museo di Ferrari in Maranello devotes 2.500 square metres of floor space to racing and track cars made by Ferrari, with many iconic exhibits from the firm`s past history. A must for car lovers, car-racing lovers or simply those who love cult and luxury, this museum should not be missed! Maranello is located around 50 km west of Bologna (about 1 ½ to 2 hours by rail) in the Modena province. Tip: the Lamborghini Museum (Sant’agata Bolognese) is just 35 km northeast of the Ferrari Museum and directly accessible by rail! For a widely variegated tourist destination, Sicily is hard to beat. From fabulous beaches and clear turquoise water to craggy mountains and shady forests, fascinating ruins to smoking volcano (at a height of 3.329 metres, mount Etna is the highest active volcano in Europe and one of the most active worldwide) and with an additional plus of unique culinary delicacies and great wines, Sicily has it all. Sicily has three international airports – Catania, Palermo and Trapani – and ferries run from major ports such as Napoli or Civitavecchia (at least 10 hours, usually overnight). Some ferries take trains, making the trip easier to plan. Established in 1993 with the aim of protecting the environment and “providing a park for everyone”, the Sibillini National Park comprises over 70.000 hectares of unspoiled natural beauty, including the Sibillini mountains and most of the Marche and Umbrian wildlands. Home to the peregrine, the golden eagle, the wolf and many other rare and endangered species, as well as a great number of mediaeval abbeys and towns, the Sibillini National Park can best be experienced on foot, horseback or by bicycle. Trains stop at Camerino, Spoleto and Ascoli Piceno; buses run to all of these and Fermo as well. Spoleto is around 60 km south of Assisi and can be reached by car in just under an hour. The Bridge of Sighs, or “Ponte dei Sospiri” as it is known in Italian, is a white limestone bridge in Venice connecting the interrogation rooms of the Doge`s palace to the New Prison. Constructed in 1600, it gained its name from reputedly offering convicts their last glimpse of Venice before their incarceration. Legend has it that lovers who kiss beneath the bridge on a gondola at sunset will gain eternal love and happiness. The Bridge of Sighs is included in guided tours of the Doge`s palace, which is nine minutes from Venice`s Santa Lucia railway station or twenty minutes by bus. Known as the “Gateway to the Dolomites”, Bolzano in northern Italy’s south Tyrol was part of the Austrian-Hungarian empire until 1918; much of the architecture and culture is markedly Austrian and many of its citizens prefer to speak German rather than Italian. Particularly worthy of a visit are the Chiesa dei Domenicani cloisters and chapel, the Castel Roncolo and the Messner mountain museum; however, Bolzano is best known for its Museo Archeologico dell’Alto Adige, which houses the famous Copper Age mummy “Ötzi”. Bolzano is located in the Trentino-Alto Adige region, 60 km north of Trento and 155 km north of Verona. It has its own airport. The capital of the Puglia region of southeast Italy, Bari is the site of so many fascinating cathedrals, castles and museums that it would be impossible to do them justice here. Perhaps the most beautiful destination of all – and among the most frequently visited – are the famous Castellana caves. Discovered in 1938 and opened to the public in 1939, the caves are 3 km long and 122 m deep, comprising 4 main sections: the “Grave”, Precipice Cavern, Black Cavern and White Cave. They have fascinated many artists and writers and 8 movies were shot in them. Bari has its own airport (Bari Palese airport) and is around 4 hours by road or rail from Rome, or just over 3 hours from Naples. This little-known “Museum of Mediaeval Rome” on the Viale Lincoln is a hidden gem for anyone interested in early mediaeval history. With 1.000 year old mosaics, jewelry and artefacts including maps of ancient Rome, weaponry and the reconstruction of the reception room of an Ostian mansion, the museum closes the gap between the ancient Roman and Renaissance cultures which predominate in the other Roman museums. The Museo Nazionale dell’Alto Medioevo is located on the first floor of the Museum of Prehistory, and is easily accessed in 45 minutes by metro from the Termini railway station (exit EUR Fermi). Football lovers of all ages will be no stranger to Milan’s famous Stadio San Siro, the largest football stadium in Italy and one of the largest in Europe and home to A.C. Milan and Inter Milan. An UEFA Category four stadium, it hosted six games in the FIFA World Cup in 1990 and was the venue for four European Cup finals. In addition, it is also used to house many other events, in particular major concerts. A museum was opened in 1998 at the entrance to Gate 8 which depicts 100 years of football history and is well worth a visit for football fans. The San Siro stadium can be reached by subway from Milan’s Centrale railway station in around half an hour (Line M5, exit Stadio San Siro). Around 60 km southwest of Bari in the Puglia region of southeast Italy lies the fascinating town of Alberobello, famous for its distinctive dry stone buildings with conical roofs: the “Trulli”. Though these highly unusual dwellings exist in other parts of Italy, nowhere are they as prevalent as in Alberobello, where there are at least 1.000 of them which were placed under UNESCO protection in 1996. Some of them have been converted into guest houses or apartments, making a stay in Alberobello a truly unique experience. Alberobello is accessible by train from Bari in around 1 ½ hours, or just over one hour by car. Recently designated the best water theme park in Europe – and at 80.000 square metres the largest theme park in Italy – Aqualandia Jesolo boasts the highest water slide in the world and the tallest bungee-jumping tower in Europe, alongside seven different themed areas, numerous shows and activities for all age groups and all interests. Situated approximately 40km north of Venice, Lido di Jesolo boasts many other attractions including a number of museums, a sea-life aquarium, sand sculptures and great bars, cafes, hotels and beaches. For a fascinating and unique glimpse into 2.400 years of Naple`s past history, Napoli Sotterranea (Naples underground) is unbeatable. Visitors are invited to descend 136 steps (35 metres) into the bowels of the earth beneath the city and view ancient Greek excavations (4th century BC), air raid shelters from WWII and an underground garden with flourishing plants, amongst other things. The tour takes around an hour, the path is smooth and even and visitors are given a candle to light their way. The entrance to Napoli Sotterranea is on the Piazza San Gaetano, just over 15 minutes from Naples central railway station by car or metro (line M1, exit Piazza Dante). Cervia is a town on the northeast Adriatic coast of Italy in the Emilia Romagna region, less than 30km south of the city of Ravenna. It is known for its 10km of beach, its butterfly house (the largest in Italy) and its ancient salt marsh and salt museum, as well as for its festivals and events, of which by far the most famous is the international kite festival held annually from the end of April to the beginning of May. Offering swimming, boating and windsurfing as well as historical ruins and mosaics, Cervia is an easy and relaxed venue for the whole family, hospitable, well-organized and child-friendly. Cervia can be accessed in under 30 minutes from Ravenna by car, or around 50 minutes by train. Ravenna has its own airport. For anyone looking for a unique holiday experience well off the beaten track, Civita di Bagnoregio (120 km north of Rome) is not to be missed. Originally founded by the Etruscans over 2.500 years ago on a plateau of tuff, the town is being slowly destroyed and its buildings falling off the edge of the cliff due to erosion; currently only around 12 people live there, with maybe 100 in the summer. The site is inaccessible by car and the streets of Civita are car-free; visitors who wish to see Civita must walk from Bagnoregio new town to the near-ghost village over a footbridge (around 20 minutes and steep). Buses run from Orvieto (around 45 minutes) or Viterbo (30 minutes) to Bagnoregio. The island of Pantelleria in the Strait of Sicily, officially part of Italy, is actually closer to Tunisia than to Sicily and Tunisia can be seen from its shores on a clear day. Pantelleria`s few coves and beaches are only accessible by boat, possibly the reason it has largely escaped the eye of the tourist industry. With many hot springs and fumaroles related to volcanic activity as well as natural spas and mud baths, the island is a natural wellness resort as well as an ideal venue for trekking, diving, mountain biking and fishing. Pantelleria has its own airport, alternatively the island can be accessed by ferry from Trapani, Sicily in just over 2 hours. No visit to Rome would be complete without a view of the famous “Fontana di Trevi”, the termination of the Aqua Virgo Aqueduct (19 BC), built at the junction of three roads which gives it its name (“tre vie”). Built between 1732 and 1762, at 26.3 metres high and 49.15 metres wide, it is the largest Baroque fountain in Rome and one of the largest in the world. Visitors to Trevi fountain should be aware that it is one of Rome’s major tourist attractions and that, though the fountain itself is enormous, the square which houses it is not. Major crowds are to be reckoned with. That said, it is a quite stupendous sight and well worth a visit. Access is best via metro from Rome’s Termini railway station (13 minutes, exit Piazza di Trevi). Approximately 170 km north of Rome in central Italy lies the city of Perugia, the capital of the Umbrian region. Now largely a university city, it was established as a town during Roman times, though many parts of it were repeatedly destroyed by wars and earthquakes and had to be rebuilt. It has its share of Roman and mediaeval architecture (particularly interesting are the “Whispering Arches” in the Provincial building on the Piazza Italia) and a number of museums, but is particularly well-known for its festivals: the Umbria Jazz festival (July), the annual Festival of Journalism (April) and the Eurochocolate festival (October), which attracts around 900,000 visitors annually. For chocolate lovers of any age, this international festival is a must and a great opportunity to buy sweet gifts and mementoes. Perugia can be reached by train or car from Rome in around 2 ½ hours. It has its own airport. Anyone interested in the legends of Merlin and King Arthur will be fascinated by San Galgano’s Hermitage of Montesiepi chapel, which houses a real sword in a real stone! Legend has it that Galgano Guidotti (1148-1181), a thoroughly nasty character by all accounts, decided to renounce wining, wenching and warmongering and become a Christian, and thrust his sword into a stone expecting it to break. He was canonized in 1185 and the site turned into a chapel, which is open to the public. Close by are the famous ruins of San Galgano abbey, a hauntingly beautiful building with its roof open to the sky, built between 1218 and 1288. San Galgano lies around 30 km north west of Siena and can be reached by road in 45 minutes, or by bus in just over an hour. Siena has its own airport: the nearest international airport is in Florence. The “Valle dei Templi” is not actually a valley but a ridge just outside the town of Agrigento on the southern coast of Sicily, which houses a staggering total of seven Greek doric temples, built around 400 BC, in a better state of preservation than any outside of Greece. The town of Agrigento itself is home to many Greek and Roman buildings and other edifices, a fine archaeological museum and a unique brand of ice-cream made from sheep`s ricotta, as well as kilometres of long and largely deserted white sandy beaches. Agrigento is 2 hours south of Palermo by road or rail. Palermo has its own airport, alternatively ferries run regularly from most Italian ports, the nearest being Naples and Civitavecchia. The “Lago di Garda” is Italy’s largest lake and a popular holiday destination, both nationally and internationally. Situated midway between Verona and Brescia, surrounded by mountains to the north and with a particularly mild climate, it is an idyllic destination for the entire family. Camping is particularly popular, and camping sites abound; the area is also ideal for lovers of hiking, trekking, rock-climbing and watersports of all types. Add long sandy beaches, great restaurants and boutiques and a vibrant nightlife, and it is not difficult to see why Lake Garda is so popular. Lake Garda covers a surface area of around 370 square kilometres, so the choice of where to stay can be a little difficult. Torri del Benaco (just over 1 hour) and Nago-Torbole (2 hours) are particularly picturesque! (Times given by road or rail from Verona). At a diminutive 20 square kilometres in size, Lampedusa is nonetheless the largest of the Pelagie islands (south of Sicily and located in the Mediterranean between Malta and Tunisia), yet the island’s idyllic Rabbit Beach is claimed by many to be the most beautiful beach in the world. With crystal clear turquoise water and fine white sand, it is everything a beach should be and then some. A few metres from Lampedusa`s west coast lies Rabbit Island, a nature reserve and the only place in the Mediterranean where the loggerhead sea turtle lays its eggs, also with stunningly beautiful beaches.. Both Lampedusa and Rabbit Island are very quiet and little touristy; for more tourist attractions, the nearby island of Linosa is better equipped! Lampedusa has its own airport, and the larger Pelagie islands are accessible by ferry from Agrigento, Sicily (overnight crossing, up to 9 hours). The Valcamonica is a large central Alpine valley located in eastern Lombardy, famous for one of the largest collections of petroglyphs worldwide. Between 200.000 and 300.000 rock drawings, over 8.000 years old, cover the surfaces of the valley, most notably in Capo di Ponte, Darfo Boario Terme (which is also a spa and wellness resort) and Paspardo. The drawings were recognized by UNESCO – as Italy’s first World Heritage Site – as early as 1979. Valcamonica lies 67km to the north of Brescia (under 1 hour by road) and trains run regularly from Brescia to Darfo Boario Terme (around 1 ¼ hours). With 220.000 square metres of rides, games and shows, Etnaland is the largest theme park in southern Italy and on the top 10 of Sicily`s summer attractions. Whether spectacular, exciting or romantic, Etnaland offers fun and enjoyment for all tastes with its theme park, its Aqua Park and its prehistoric park, as well as playgrounds and events for smaller children. Children under 1.5 metres in height will not be admitted to some rides, however entrance is free for children 1 metre in height and smaller. Catania, on the east coast of Sicily, is the nearest city and has its own airport. Belpasso is around 25 minutes by bus, however Etnaland is over 8 km from the railway station so car rental or taxi are advisable. Milan`s “Holy Mary of Grace” is a Dominican convent off Milan’s “Corso Magenta”, 18 minutes by subway from the Milano Centrale railway station (exit “Piazza di Santa Maria delle Grazie”). Completed in 1469 after decades of construction work, this Renaissance building is largely famous for housing Leonardo da Vinci’s fresco “The Last Supper”, surpassed in fame only by the Mona Lisa. Despite many mishaps and much neglect and consequent decay, the painting draws so many visitors that it is advisable to book an entrance ticket at least two months in advance. Initially established by the future King Victor Emmanuel in 1856 to protect the alpine ibex from extinction by indiscriminate hunting, this 703 square metre region in the Graian Alps (northwest Italy) is now home to many other endangered species. Moreover it offers a wealth of winter sports in winter and summer skiing, mountaineering, rafting, horseback riding, paragliding and even golf in the summer months. Aosta, the capital of the Valle d`Aosta, is an ideal starting-point for exploration of the Gran Paradiso National Park. Aosta lies 57 km southeast of Chamonix Mont Blanc in France or 176 km southwest of Zermatt in Switzerland and has its own airport. The magnificent Royal Palace of Palermo or Palazzo dei Normanni (Norman Palace) is the oldest royal residence in Europe. Built on the remains of Punic settlements still visible in its basement, the Palace combines arabic, norman and Renaissance influences in a truly fascinating way. Its Palatine Chapel boasts some of the finest Byzantine mosaics and Saracen arches still in existence, and it is also host to the Astronomical Observatory of Palermo and the seat of Sicily’s regional government. Palermo, capital city of the island of Sicily, has its own airport. The Palazzo Reale is 13 minutes from Palermo railway station by bus (exit Piazza Indipendenza) or 22 minutes on foot. 49 km southeast of Rome in the Lazio province lies the historical town of Valmontone, which in 2011 opened its theme and amusement park “Parco Rainbow Magicland”. With 35 attractions and rides (including water rides in summer) covering a surface area of around 16.000 square metres, Rainbow Magic Land is an ideal day trip for the whole family away from the bustle and noise of Rome. Trains run regularly from Rome’s Termini railway station to Valmontone (½ to ¾ hour); a free shuttle service is available from Valmontone railway station to Rainbow Magic Land. The largest aquarium in Italy and one of the largest in Europe, this 3.100 square metre aquarium is located in the old harbor part of the city of Genoa and attracts over 1.2 million visitors annually. 15.000 sea creatures and over 400 species have their home here in a total of 71 tanks and present a fascinating insight into oceanic life for young and old alike. The Aquarium is located on the Ponte Spinola, around 15 minutes from Genoa Piazza Principe station by metro (exit: Ponte Spinola) or just over 20 minutes on foot. Known as “the little Jerusalem” because of the well-integrated, strong Jewish contingent amongst its community, the town of Pitigliano on the border of the Lazio region (Rome) is best known for its Etruscan remains and mediaeval and Renaissance monuments. Balanced elegantly on top of a limestone cliff, the town offers superb views of the Tuscan countryside surrounding it, dominated by the Medici aqueduct, a superb example of Renaissance engineering. Pitigliano is accessible by bus from Grosseto in just under 2 hours, or just over 1 hour by car. Car rental is advised. Designated the number one attraction in Pombia, the Safari Park covers an area of 43.000 square metres and consists of an animal safari park and an amusement park with 30 different rides and shows. Moreover, it boasts an aquarium, an insect house and a reptile house, as well as lions, tigers, elephants, giraffes etc. as well as a bar, a pizzeria, a sandwich bar and a barbecue house. The Safari Park Pombia is directly accessible from Milan Malpensa airport (1 hour 22 minutes by bus, or 20 minutes by car). One of the most important buildings in Bologna, this 16th century former University now houses the municipal library and the anatomical theatre with its famous dissection table and statues of the “Spellati” (skinned figures), Apollo and Hippocrates. The theatre was almost totally destroyed in a bomb raid in 1944 and was painstakingly reconstructed in exact detail after the war. The “Archiginnasio” is easily accessed by bus from Bologna Centrale railway station in less than ¼ hour (exit: Piazza Galvani), or under ½ hour on foot. The “New Castle” of Naples, often known locally as the “Maschio Angioino”, was so named by Charles I of Anjou – who ordered its construction in 1279 – to distinguish it from the older Castel dell`Ovo and Castel Capuano. Optically, the castle looks exactly as a mediaeval castle should look; with towers, turrets, imposing gray walls and its sheer unbelievable size, it dominates the surrounding scenery as one of Naples’s most significant landmarks. The Castel Nuovo can be reached in 8 minutes by metro from the Stazione di Napoli Zentrale, or 30 minutes on foot. A fascinating educational and interactive theme park for children of all ages and young-at-heart adults, “il parco degli alberi parlanti” offers a delightful day out with the whole family when staying in Venice (26 km). Whether cartoons and the history of cinema, discovering the four elements or trying out the experiments and inventions of Leonardo da Vinci happen to be your thing, the Talking Tree Park is sure to please. Treviso has its own airport; trains run regularly from Venezia Santa Lucia railway station to Treviso Centrale (around 30 minutes). During the Middle Ages, pilgrimages to holy places were very prevalent. Alongside the more famous Camino de Santiago (which runs to Compostela di Santiago in Spain) was the Via Francigena or Way through France, traditionally linking Canterbury in England to Rome through France and Italy. The route is currently enjoying a revival among pilgrims and hikers, and guided tours with accommodation are available starting from Aosta, Ivrea or Vercelli in the north of Italy, or Siena or Viterbo in the south, taking in many delightful 11th and 12th century villages on the way. (From Aosta to Rome is around 750 km). Shorter stretches of the Via Francigena can be covered on foot or bicycle, or by car or coach. The sheer wealth of attractions on this most beautiful of Italian islands makes it difficult choosing what to visit first! Situated in the Tyrrhenian Sea off the Gulf of Naples, Capri has been a holiday resort since the times of the Romans, and much of its architecture bears witness to that. Public and private beaches flank clear turquoise water and the gardens (particularly the Gardens of Augustus) and views (from Monte Solaro, the island’s highest point – access by cable car) are unforgettable. The closest airport to Capri is Naples Capodichino; ferries depart for Capri from Naples regularly (or less frequently from Salerno, Amalfi or Positano), which takes around one hour; alternatively the island can be accessed by helicopter. Ostia Antica is the name given to the ancient harbor of Rome, originally at the mouth of the river Tiber but owing to silting now 3 km inland, which may well have been the first Roman colony. An archaeological site covering 10.000 acres and surrounding a main road nearly 2 km long, it is famed for the excellent state of preservation of its buildings and walls, and for its magnificent and beautifully restored frescoes and mosaics. A museum, restaurant and toilet block are available, otherwise the site is relatively uncommercial. Ostia Antica is easily accessible by train from Rome in just over an hour (exit Rovine di Ostia Antica); the ruins are a 5 minute walk signposted from the railway station. A fascinating and unforgettable destination little known to foreign tourists is Matera, 66 km south of Bari in the Basilicata region of southern Italy. Largely known for its extensive series of troglodyte cave-dwellings or “Sassi” which date from as early as 7.000 BC and are suspected to be the first human settlements in Italy, Matera boasts some very fine stone churches and frescoes, 3 nature reserves, a number of museums and a great many festivals. Curious visitors can dine or even lodge in a “sassi”, many of which have now been modernized for that purpose. Matera is best reached by car (around 1 hour), bus or train (90 minutes) from Bari. The best-preserved of Rome’s monuments and one of the most frequently visited (6 million visitors in 2013), this 2.000 year old Doric temple is still in use today as a church and has been since the 7th century. Commissioned by Marcus Agrippa and completed by Hadrian around 126 AD, it came to be viewed as such a classic example of Roman architecture that it has been copied all over the world. The Pantheon can be reached in under 20 minutes by subway from Rome’s Termini railway station (exit: Piazza della Rotonda). Venice Carnival probably started in 1162 and was made official during the Renaissance, was stamped out by the French when they invaded Venice in 1797 and was only resurrected in 1979. Since then, it has become famous throughout the world for masked shenanigans in the month leading up to Lent; certainly, anyone visiting Venice during this time should be sure to buy a mask and join in the fun! Certain events and parties are on offer, which can be very expensive. However, on the Piazza San Marco many other events and spectacles take place which are free! The Piazza San Marco can be reached from Ferrovia B (1 minute on foot from Santa Lucia railway station) by waterbus, exit Rialto C and walk 500 metres. The thermal water of this small town in the Veneto region of northeast Italy, 10 km southwest from Padua, has made it a spa and wellness resort for the past 2.000 years! Legend has it that Hercules and his cohorts bathed in the water and felt so miraculously restored that they no longer wished to return to Greece, dubbing the spring “Aponon” (“that which relieves pain”), which gives the town its name. Today as in antiquity, the town is a spa and wellness resort with many other attractions, culinary and cultural. Abano Terme is easily accessible by train (8 minutes) or bus (33 minutes) from Padua. Rome’s famous Biopark has much in common with a safari park – there are no bars, and animals are kept very much in concord with their natural habitat. Located in the Villa Borghese in central Rome, and only twenty minutes`walk from the Spanish Steps and the Colosseum, this lush natural zoo provides welcome rest and diversion from the hectic activity and bustle of a great city. The zoo plays an important role in rescuing rare animals from extinction, successfully breeding the white collar Mangabey and Kleinmann’s tortoise, amongst others, and offers a playground for children as well as a snack bar and restaurant.. The Bioparca di Roma can be reached in around 23 minutes by bus from Termini railway station (exit: Paisiello di Bellini). Lovers of Byzantine art and architecture will be amazed at how much of both are to be found in the lesser known town of Ravenna, which despite its relative obscurity was the capital city of the Western Roman Empire, then of the Ostrogoths, then of Lombardia and, in more modern times, of the Province of Ravenna. Small though it is, Ravenna (21 km north of Cervia, 23 minutes by train) has no less than 8 monuments listed as World Heritage Sites, and is well worth a visit. Nearest international airport is Forli (90 minutes by train, 35 minutes by car). Perhaps best known as the backdrop of three Shakespeare plays – “Romeo and Juliet”, “The Taming of the Shrew” and “Two Gentlemen of Verona” – the city of Verona in the Veneto region of northern Italy has roots going back to at least 300 BC and has been a tourist destination for a number of centuries, attracting such distinguished visitors as Mozart and Goethe, among others. Juliet`s balcony and the houses of Montague and Capulet (genuinely rivalling families in the 1300s with the names of “Capuleti” and “Montecchi”) are among the best-visited but by no means the only attractions Verona has to offer. Verona has its own airport; shuttle buses run every twenty minutes from the airport to the city center. It is 120 km west of Venice (90 minutes by train and under 1 ½ hours by car). Dubbed “Italy’s Hollywood”, the Cinecitta Studios were founded in 1937 by Benito Mussolini to promote Italian films, but also inarguably for propaganda purposes. Many famous Italian and international films have been shot there, including “La Dolce Vita” (1960), Zeffirelli’s “Romeo and Juliet” (1968) and Fellini’s “Casanova” (1976), as well as Mel Gibson`s “The Passion of Christ” in more modern times. For a unique glimpse into the workings behind the big screen for film lovers of all ages, the Cinecitta Studios are a must for visitors to Rome. The studios are on the Piazza di Cinecitta, easily accessible by metro from Rome’s Termini railway station in around 25 minutes. Home of two papal tombs and the relic of a saint (the head of St. Apollonia), this 4th century Basilica in central Rome is probably the first Roman church which was dedicated to Mary. Particularly famous are the 12th and 13th century mosaics decorating its exterior and interior. According to legend, the church was founded on the site of an old inn, in which a well of olive oil sprang into being at the moment Christ was born. The Santa Maria in Trastevere is accessible from Rome Termini railway station in under 30 minutes by bus (exit Sonnino – San Gallicano, then 4 minutes on foot). The “Spanish Steps” is a series of 135 steps connecting the Piazza di Spagna with the church at the top of the Piazza Trinitá dei Monti, with excellent views of the city of Rome. The steps were originally designed for a competition in 1717; frequent restoration has since taken place. A pleasant spot to take a break, picnicking on the steps is sadly forbidden and the steps are generally rife with tourists. Definitely worth a visit if only for the view, the “Scalinata della Trinitá dei Monti” are accessible in 7 minutes by subway from Rome Termini railway station (exit: Spagna). Established on Sicily in 1981, the Zingaro nature reserve is a stretch of coastline and cliffs approximately 7 km long on the Gulf of Castellammare. The area includes water sources and resting points as well as signposted paths for visitors, beautiful beaches and coves for swimming, some museums and the breathtaking Uzzo Grotto, and is home to 39 species of wild bird, including the kestrel and the peregrine. The Zingaro Nature Reserve is best reached by car; public transport is poor. The nearest town is Scopello (around 1 hour 20 minutes from Palermo). Turin`s Palatine gate (aka Palatine towers) dates from the 1st century BC and is one of the best-preserved Roman gateways in the world. The only surviving example of originally four city gates, it consists of two sixteen-faced towers over 30 metres high with a 16 metre long windowed connecting structure (“interturrio”). Together with the 20.000 square metre archaeological park surrounding it, which was opened in 2006, the Porta Palatina offers an atmospheric and peaceful resting place from the bustle and noise of the city. Tip: the Cappella della Sacra Sindone, which houses the Holy Shroud of Turin, is only two blocks away! Lovers of modern and surrealist art shouldn`t miss this museum with its private collection of works by Picasso, Dali, Magritte, Klee and others. Idyllically set in an 18th century Venetian palace on the Grand Canal – which was Peggy Guggenheim’s home for thirty years – in front of the Nasher Sculpture Garden, the Museum invites the discerning visitor to linger a little longer just to enjoy the view! The Peggy Guggenheim Museum can be reached by waterbus from the P. le Roma (Parisi) “E” landing station (exit Spirito Santo). Around 20 km northwest of Pisa lies the enchanting town of Lucca, one of the most picturesque and colorful towns in Tuscany with a history going back to the Etruscans. Known as the “City of 100 churches”, and with a series of perfectly intact Renaissance city walls, Lucca presents a marked contrast to the city of Pisa and is a wonderful place to relax, soak up the atmosphere and have a bite to eat! Both trains (39 minutes) and buses (around 80 minutes) run regularly from Pisa to Lucca. The largest maritime museum in the Mediterranean, Genoa`s “Galato Museo del Mare” opened in 2004 and became an immediate success with visitors to the city. The museum displays over 6.000 historical artefacts concerned with man`s relationship to the sea, going right back to Christopher Columbus who was born in Genoa and including a lifesize replica of a 17th century galleon. A fascinating day trip for those visiting Genoa, the Galata Museo del Mare is 8 minutes on foot from the Piazza Principe railway station. The botanical gardens in Padua, founded in 1545, are the oldest botanical gardens in the world still to be found in their original location. On a total of 22.000 square metres of land, this forefather of all botanical gardens was originally given over to the cultivation of medicinal plants for educational purposes, with profound influence on the study of chemistry, botany, medicine and pharmacy. Still in use today for purposes of education and research, the botanical gardens – closely affiliated with the University of Padua – play an important role in the protection of endangered species. The botanical gardens are accessible in 11 minutes from Padua`s main railway station (exit: Businello fr 5). One of the most beautiful towns in Italy, Castelmezzano (literally: “the castle in the middle”) gained its name from being midway between the castles of Albano di Lucania and Pietrapertosa. With origins going back to the middle of the 5th century BC, the originally Greek settlement was forced by Saracen invasions to relocate; Castelmezzano quite literally took to the mountains. Located in the lesser known Basilicata region in southern Italy, Castelmezzano lies around 95 km southwest of Bari and can be accessed in just over 2 hours by car. Public transport is very poor; car rental is advised. The Castle of Moncalieri in the Piedmont region of northern Italy, listed by UNESCO as a World Heritage Site in 1997, was originally built as a fortress around 1100 and was added to and modified in the centuries which followed, notably by the architect Carlo di Castellamonte (1560-1641). Though damaged by fire in 2008, the historical rooms are generally open to the public. Moncalieri is around 13 km southwest of Turin (around 45 minutes by train or 27 minutes by car). The small town of Positano, nestling in the hills of the Campania region above the Amalfi coast, is another lesser known yet beautiful Italian destination. Mentioned in Harper`s Bazaar in 1953 by John Steinbeck, Positano has also been the venue for a number of films; it is most famous for its Byzantine icon “The Black Madonna”, in the church of Santa Maria Assunta, which also boasts a fine dome made of majolica tiles. The best way to reach Positano without a car is to take the hydrofoil or ferry from Naples to Sorrento (around 35 minutes) and then the bus from Sorrento to Positano (72 minutes). The city of Parma in the Emilia-Romagna region of northern Italy is the capital of the province of Parma, rightfully famous for its Parma ham and parmesan cheese and seat of one of the oldest universities in the world. Probably established as a city by the Etruscans, evidence suggests that it was a settlement as early as the Bronze Age. Particularly worthy of a visit is the Camera di San Paolo with its well-preserved frescoes by Correggio and its Teatro Regio theatre and opera house (open to the public). Parma has its own airport, named after the composer Giuseppe Verdi who was born in the province of Parma. It is around 100 km northwest of Bologna, around 1 hour by rail or road. Another of those well-hidden Italian gems, Caserta in the Campania region of southwest Italy is the perfect destination for a day trip when visiting Naples. Best known for its magnificent palace, the “Reggia di Caserta” (which was used as the backdrop for Queen Amidala`s residence in “Star Wars”), and surrounding parks and gardens (3.5 kilometres long), Caserta has some fantastic restaurants and does a great line in buffalo mozzarella too. Casertais around 24 km north of Naples and can ben reached by road or rail in around 40 minutes. Amalfi is the ideal place to stay when exploring the Amalfi coast. The former capital of the maritime republic or “Duchy of Amalfi”, today Amalfi is a lively seaside town with a flourishing tourist industry. Whether churches and historical monuments are your thing, or sailing and swimming, Amalfi has something to suit all tastes. The Chiostro del Paradiso is definitely worth a visit, and no one should leave Amalfi without a taste of the famous Limoncello, a liqueur made from locally-grown lemons. Amalfi is best accessed by bus or train from Naples to Salerno (just over one hour), and bus from Salerno to Amalfi, or by ferry from Naples to Amalfi (around 40 minutes). 40 km southeast of Bologna lies the picturesque and ancient town of Dozza. Largely known for its magnificent fortress – now a museum housing many Renaissance works of art – and its painted house facades, Dozza has also been known since ancient times for its high quality wines. Every two years, the event of the Painted Wall takes place, in which house fronts are painted by internationally and nationally known artists. An idyllic and unusual day trip when staying in Bologna, Dozza is accessible from Bologna in under an hour by car, or around two hours by train or bus. The word “Ghetto” has its origins in Venice: the first ghetto was established in Venice in 1516, when the Jews were compelled to live in a very small part of Venice – 105 metres long and 93 wide – close to the cannon foundries. This ghetto existed until it was dissolved by Napoleon in 1797. Most of the Jews still living in the ghetto were deported and murdered from 1943 onwards; today the area on the Isole di Cannaregio houses a number of Jewish museums and synagogues, though of the roughly 500 Jews living in Venice only a small proportion still live there. Of great historical interest and significance, the Campo del Ghetto Nuovo”is only 9 minutes walk from Venice`s Santa Lucia railway station (cross at Ponte delle Guglie). This imposing part Romanesque, part Gothic cathedral was built between the twelfth and the fourteenth centuries, with some later additions (notably the bell tower), giving it a striking mix of styles. Flanked by two imposing stone lions, and with its unique striped exterior, this beautiful cathedral is even more impressive inside. Frescoes by a number of Renaissance artists adorn the walls and the cathedral houses some very fine statues as well as the Museum of the Treasury in its basement. The San Lorenzo cathedral stands on the Piazza San Lorenzo, accessible by metro from the Principe railway station in 11 minutes, or in 20 minutes on foot. Well loved by such celebrities as Ernest Hemingway, Elizabeth Taylor and Ingrid Bergman in the fifties and sixties, the diminutive harbor town of Portofino on the Italian Riviera enjoys a reputation as a holiday venue for the jet set to this day. For that reason, it can be both overpriced and overcrowded in the holiday season. However, it is only 35 km southeast of Genoa and makes as pretty and unusual destination for a day trip if you are staying in that area. Portofinocan be reached by car from Genoa in under an hour, or 1 ½ hours by train. A wonderfully atmospheric place to stay if you want to explore the Lombardy region, Bergamo is only 40 km from Milan and 30 km from the lakes Iseo and Como, and situated at the base of the Bergamo Alps. The town is topographically divided into two parts: the new town is situated on a plane and the old town on a sharply rising hill. The two parts of the town are connected by funicular. Both parts of the town boast a great many historical and cultural attractions; the castle Rocca, the Donizetti museum and the Natural Science and Archaeology museum are only a few examples. Bergamo can be reached by train from Milan in just over an hour. Paestum in the Salerno province in Campania lies on the Tyrrhenian coast, with wonderful sandy beaches and clear water. However, this tiny town is best known for its magnificent Greek temples, city walls and amphitheatre, all in an excellent state of preservation. A modern museum on the archaeological site houses findings from Paestum and those from Foce del Sele (9 km north of Paestum). Guided tours are available at reasonable prices. Paestum is just over 100 km south of Naples and can be reached by train in 1 ¼ hours. One of the best-loved and most photographed bridges in Europe, and the oldest in Venice still in use, the Rialto bridge was the successor of three former wooden bridges, one of which collapsed under the weight of spectators during a boat parade in 1444. It was completed in 1591 after three years of construction and is one of the chief attractions of Venice today, linking the districts of San Marco and San Polo across the Grand Canal. The “Ponte di Rialto” is 15 minutes by waterbus from the Santa Lucia railway station; exit “Rialto C”. Probably the oldest town on Sardinia, Nora was founded by the Phoenicians and dominated, first by Carthage, then by the Romans and finally by the Vandals. Much of the former city is now under the sea, as the southern coast of Sardinia is gradually sinking into the Mediterranean; other parts belonging to the Italian military have never been excavated. However, a Phoenician temple, houses with mosaics, the Punic quarter and the remains of the Roman thermal baths are still intact, as is the famous Nora stone, inscribed in ancient Phoenician, dating from the 9th century BC. Buses run from Cagliari to Pula (around 50 minutes), which is 3 km from Nora. Car rental is advised. Porto Cesareo in the Salento area of southern Puglia, lesser known among tourists, has 15 kilometres of some of the best beaches in Italy, largely frequented by Italians. Fine white sand shallow water and few waves make them ideal for families with young children. Torre Lapillo is more inhabited, with houses and villas on the seafront; Punta Prosciutto is flanked by high sand dunes and is remoter. Torre Lapillo is accessible by bus from Porto Cesareo in 23 minutes; a shuttle bus runs from Porto Cesareo camping site to Punta Prosciutto. Best known as a landing point for the Allies during WWII, Anzio on the Lazio coast around 60 km south of Rome was a significant Roman port and the birthplace of the Emperor Nero, the ruins of whose villa can still be seen along the coast. Particularly worthy of a visit are the Villa Adele, which houses the Museum of the Landing and the Archaeological Museum, and Port Innocenziano with its shops, bars and excellent fish restaurants. A great beach and series of caves rounds off the mixture. Trains run from Rome Termini railway station once an hour (under an hour); most of Anzio`s attractions are within walking distance from the railway station. A great way to spend a day out – with or without children – is the theme park “Italia in Miniatura” in Viserba, near Rimini. Opened in 1970, it cleverly depicts famous parts of Italy and Europe on a scale of 1:25 and 1:50, as well as a complete replica of the Grand Canal of Venice on a scale of 1:5. Mediaeval battles are played out in miniature, and the park also offers a log raft ride, the “Luna Park della Scienza” where visitors can carry out scientific experiments, and a parrot park. Buses run regularly from Rimini to Viserba (8 minutes). Rimini has its own airport. Around 35 km southwest of Rimini lies the charming ancient town of San Leo, built on a sheer rock face which is impenetrable from all sides. There is only one road into and out of San Leo, carved into living rock. Most famed for its fortress, a former prison in which Count Cagliostro ended his days (now a museum), it also hosted Dante (who wrote his Divine Comedy here) and St. Francis of Assisi. San Leo is enchanting in any season and offers some of the most stupendous views in Emilia Romagna. Buses run regularly (by Italian standards) from Rimini to San Leo; the ride takes just under 1 hour. A very popular resort during the summer months owing to its magnificent sandy beaches, Tropea is located on the Tyrrhenian sea in Calabria, southern Italy. The town itself, with its historic center, is perched on the cliffs above the beaches, which makes access to the beaches (via steps cut into the cliff or a winding road) slightly strenuous. On a fine day, the Aeolian islands are visible, and a boat trip to one of them can be a highlight of a stay in Tropea. The nearest airport is Lamezia Terme (around 1 ½ hours from Tropea by train, or just over 1 hour by car). Home to the winter Olympics of 1956 and the backdrop for a number of films (including “For Your Eyes Only” and “The Pink Panther”), Cortina d’Ampezzo – or simply Cortina – offers some of the best skiing and winter sports Italy has to offer. The town itself is charming, with plenty of bars, restaurants and hotel accommodation, and at 1210 m above sea level offers incredible views of the Dolomites. The church of Madonna della Difesa, with its sculptures and frescoes, and the WWI monuments are of particular interest. The airports of Venice Treviso and Venice Marco Polo are both less than 2 hours from Cortina by car, or just over 2 hours by bus. Formerly the home of Frederick Stibbert (1838-1906), this unique private collection of weapons and armor predominantly from the 16th to the 19th centuries will take your breath away simply by reason of its vastness. His villa – and the adjoining one, bought by Stibbert when his own home became too small to house his collection – is decorated throughout in mediaeval style and the estimated 16.000 exhibits of Moorish, Islamic, European, Etruscan and Japanese arms (the largest outside Japan) are displayed “in action”, with dramatic effect. The “Museo Stibbert” is 19 minutes from the Largo Alinari station, or 14 minutes by car. With over 400 animals over a 7 hectare area and diverse free activities and playgrounds for children, the Pistoia Zoo – 40 km northwest of Florence – is a great venue for a day trip with kids. With a number of special activities – the Zoo caters for children`s birthdays, offers summer camps and close animal encounters and is periodically even open at night – it is a very flexible option for entertaining children away from the noise and bustle of the city. Pistoia can be reached by car from Florence in around 40 minutes, or just over 1 hour by train. Basilicata, aka as Lucania, is a region in southern Italy (between the “heel” and the “toe” of the boot!). The Lucania Park in the village of Cirigliano (Matera district) offers a wide range of adventurous activities such as tree-canopying and archery; in nearby Castelmezzano, a terrifying zipwire experience (Il volo dell’Angelo) is on offer for kids over 12 with an adult (or over 16 unaccompanied); a similar ride (Il volo dell’Aquila) can be had at San Costantino Albanese. These two daredevil experiences constitute a major tourist attraction in the area. Bari Palese (178.5 km) or Lamezia Terme (249 km) are the closest airports, car rental is advised. The Frasassi cave system in Genga, central eastern Italy, was discovered in 1971 and has become one of the most popular cave systems in Italy. Richly endowed with stalactites and stalagmites and illuminated for eerie and dramatic effect, the caves are a perfect activity for a rainy day! A number of guided tours are on offer, lasting from 1 to 3 hours. Visitors are advised to book in advance. The Falconara Marittima airport is 56 km from Genga (49 minutes by car). Public transport is poor; car rental is advised. Sorrento in the Campania region in southern Italy (on the Gulf of Naples) offers a somewhat different holiday experience – lessons in making pizza and gelato. At the Villa Capo Santa Fortunata, it is possible to book a four day, three night stay with all ingredients, courses, PDF of recipes and a souvenir apron included. A really fun activity and an unforgettable experience, this course will really boost your cooking skills! Naples airport is only 50 km from Sorrento, which is just over 1 hour by bus or train. Opera and theatre lovers should not miss this unique glimpse backstage into one of the most famous opera houses in the world. The auditorium, the stage, the pit and portraits and history of the famous artists connected with “La Scala”, as well as the history of the opera house and a tour of the costume rooms, are all included in a guided tour of around one hour duration at a very reasonable fee. Tours should be booked in advance. La Scala is on the Via Filodrammatici, 15 minutes by metro from Milan`s central railway station. Venice’s history of regattas goes back to the start of the 13th century. Traditionally beginning on the first Sunday of September, the “Regata Storica” is one of the city’s best loved annual events, combining exciting and entertaining races and competitions with boats largely in 16th century style. The water pageant commemorating the arrival of the Queen of Cyprus (who gave up her throne in favor of Venice in 1489) is a particular highlight. The Regata Storica takes place all along the Grand Canal, easily accessed by waterbus from landing stage D of the Santa Lucia station. One of the most picturesque routes in Italy, the Chiantigiana (SR 222) runs from Siena to just south of Florence (around 69 km), taking in thousands of acres of vineyards and all the most important towns involved in the Chianti wine trade, from historical times to the present day. Many of the farms and vineyards on the way offer wine sampling or demonstrations of wine-making techniques, though it is advisable to make reservations in advance. Obviously, fall is the best time for this activity, when the grapes are being harvested, though the route through the rolling countryside of Tuscany is scenic at any time of the year. The Chianti Wine Trail can be pursued by bicycle, car or coach; guided coach tours are also available.